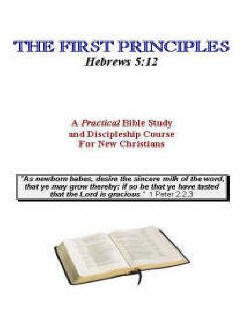 Below are the lessons for the discipleship study course in various formats. The first column is each lesson in HTML, and will come up on your computer just like this page did. The formatting is not as nice as the PDF format, but sufficient for you to print out and work away with. The Adobe PDF file format is much nicer, and once downloaded, can be printed out for use. You can adjust the PDF print paper size that is appropriate for your region . The Mp3 files you will have to download and listen from your computer, but based on your computer's abilities, they may play almost instantly. Not all lessons have been recorded into MP3 format yet, so be patient as I upload all these audio files for you to use. Download the Discipleship Director's Handbook on how to run a Discipleship Ministry in your church. These studies are free to be used by anybody, but are copyrighted, Craig Ledbetter, (C) 1994-2013 and may not be republished for any costs without the prior written permission of Craig Ledbetter. Email Pastor Craig for more information on obtaining these materials in bulk for your church or Bible Study group. The entire Discipleship Course can be purchased on a CD in MS-Word format, and in PDF format. You can print out these studies and work through them on your own, or email Pastor Craig, and he will arrange for a Discipler to meet with you and begin showing you the wonders of God's word!. If you want to study the entire course, or receive all the lessons by email, or snail mail, click here and just ask for it to be sent to you lesson by lesson! NOTE: The entire course is available as a PDF file (2.6MB though) - you will need to have Adobe Acrobat on your computer to read the document)!